This post may contain affiliate links. Read our affiliate disclosure for more details. Warm weather brings about new growth of beautiful flowers, healthy fruits, and vegetables, as well as weeds…including the poisonous ones (those tend to be the heartiest). Poison Ivy, Poison Oak, and Poison Sumac are not only vigorous weeds but for most people, they can cause an allergic reaction. With families, especially children, being outside playing in the yard, or going to camps, the chance that someone could come across one of these weeds is highly likely. So it’s good to know what to look for if you think that you or your child have been exposed to a poisonous weed. 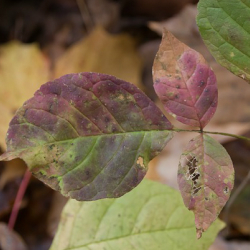 Exposure to poisonous leaves such as poison ivy, poison oak, and poison sumac can cause an inflammation and irritation of the skin (atopic dermatitis). Even minute amounts of exposure can lead to a skin rash. (3) This is one of the most common allergic diseases in the United States, with more than 25 million Americans needing treatment after exposure. (2, 4) People at the highest risk for a skin rash from poisonous leaves are landscapers, gardeners, farmers, and firefighters. What causes a skin rash from poisonous leaves? What triggers a skin rash from a poisonous leaf? The triggers for a skin reaction from poison ivy, poison oak, and poison sumac are simple. Simply brushing against the plant can trigger a reaction for most. Some people choose to burn the plants when they get out of control. Inhaling the smoke can also cause a reaction. What are the symptoms of a skin rash from poison ivy, poison oak, or poison sumac? How is poison ivy, poison oak, or poison sumac diagnosed? Diagnosis is made by assessing the physical symptoms. But usually, the causative agent is known. If you are unsure if the rash is caused by a certain plant, using extreme caution, obtain a picture or sample of the leaf to your doctor. How is poison ivy, poison oak, or poison sumac treated? What is the prognosis for people with poison ivy, poison oak, or poison sumac? Itching and rashes last about one to two weeks. 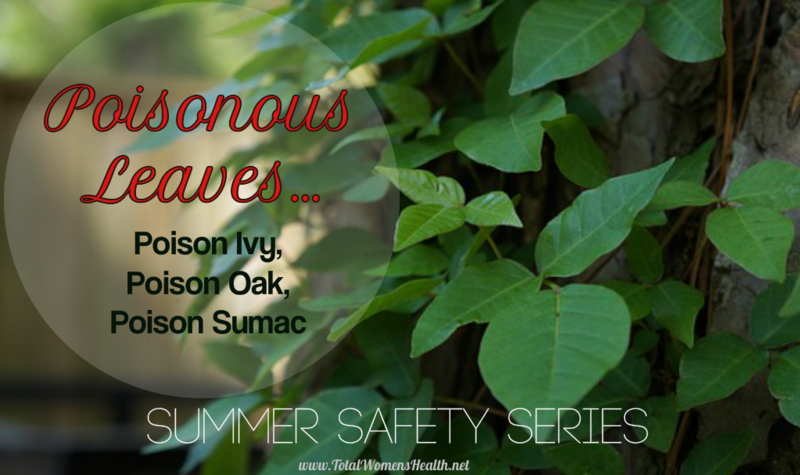 How can poison ivy, poison oak, or poison sumac be prevented? Know what the poison ivy, poison oak, and poison sumac look like and be aware of your surroundings whenever you are near plants. Often times, these plants can blend in with other plants along the ground or be mistaken for ivy growing up trees. The general rule of thumb that I was taught as a child…’leaves of 3, let them be’! The information in this article is to be used for informational purposes only. It is NOT to be used in place of, or in conjunction with, professional medical advice. Anyone with questions regarding this or other medical issues discussed on this site must consult their physician for further information and treatment. Only a Licensed Medical Professional can diagnosis certain ailments and prescribe treatments and medications for you. Do not ignore or delay seeking medical advice or treatment because of any information obtained from TotalWomensHealth.net. The owner of and writers for TotalWomensHealth.net are not acting in the capacity of a doctor, licensed dietician, psychologist or any other licensed/registered professional. You agree that TotalWomensHealth.net, its directors, officers, employees or other representatives shall not be liable for damages arising from the information and content viewed and obtained via TotalWomensHealth.net. You agree that this limitation of liability is comprehensive and applies to personal injuries and all damages of any kind, including without limitation direct, indirect, incidental, general, special, punitive, compensatory and consequential damages. Health. I do have a couple of questions for you if it’s allright. Is it only mme oor does it give the impression like some of thesze remarks come across like tey arre written bby brain dead visitors? to kdep up with everything fressh you have to post.